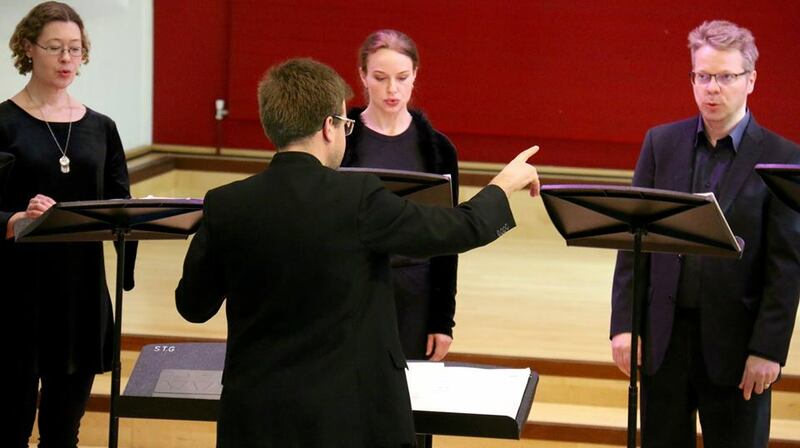 On this day Canterbury Christ Church University was honoured to be visited by the Helsinki Chamber Choir, who were kind enough to visit on the way to their performance at the London Ear festival, a celebrated five-day event encompassing many different styles of contemporary music. The Choir themselves, established in 1962, were on their first tour of England, choosing Canterbury as their first stop. Despite being proficient in many styles of choral performance, often incorporating many different pieces from across the centuries of western song in their repertoire, under the direction of conductor Nils Schweckendiek the ensemble chose to forgo traditional choral practise in this performance, and instead chose pieces designed to push and further explore the manifold capabilities of the human voice in an instrumental setting. In order to achieve this aim, the choir chose to perform a set entirely comprised of contemporary compositions. The first of these, entitled ‘Cries of London’ by Luciano Berio, has been described as a contemporary classic, designed to recreate for the audience the multitudes of sounds that can be encountered within the streets of the bustling capital city. This therefore creates a broad scope of interpretation for the choir, who shout, whisper, whine and whistle in order to create the desired atmosphere. Indeed, despite the presence of their conductor the choir create the impression of a free improvisational variation on the original composition, something that would have no doubt been encouraged by the pieces late composer. This experimental vein was then continued into the next piece, a composition by the Japanese artist Malika Kishino dedicated as a prayer to those affected by the Fukushima nuclear disaster. This piece creates a sombre air, with the choir mimicking the whirring and bleeping of machinery alongside the whooshing of the wind, which carried the deadly nuclear fallout across the surrounding landscape of Fukushima so indifferently. This was the first public performance of the piece for the Helsinki choir, who interpreted the piece effortlessly into their existing set, despite its stark non-western composition. The next piece, written for the choir by Estonian composer Alejandro Vinao, was also performed in its entirety today for the first time, with all three movements being showcased. The piece features a multilingual account of the horrors of war, with the choir using the piece to further expand the atmosphere created in the last. The choir then finished their performance with a piece by Antti Auvinen, appropriately titled ‘on, -ne, -ni’. This final piece saw the choir further exploring their own vocal potentialities, creating whistles, popping and bangs in monosyllabic flashes of energy. The piece, designed to showcase the variations of pitch and timbre achievable by a choir was concluded with the bursting of brown paper bags, brining the performance to a sudden and almost startled end. It was therefore in this departure from traditional choral practise that the Helsinki Chamber Choir managed to create intrigue and truly manipulate the atmosphere surrounding them, and as such they remain one of the most radical and unique ensembles both within this century and the last.